It might look heavyweight and imposing, but this is a surprisingly sensitive drum. Refined tone with musical rim shots. It looks like a beast. The Sledgehammer is one of the biggest bruisers of the bunch, with a 14"x6 1/2" shell of 1.2mm gauge brass, hammered with large dimpled craters for a more complex tone. The finish is dark-ish antiqued brass and the shell has a vertical weld join which is invisible from the outside. The bearing edges have the traditional 45 degree turnover and all the hardware again has the antique brass finish for a unified, imposing look. 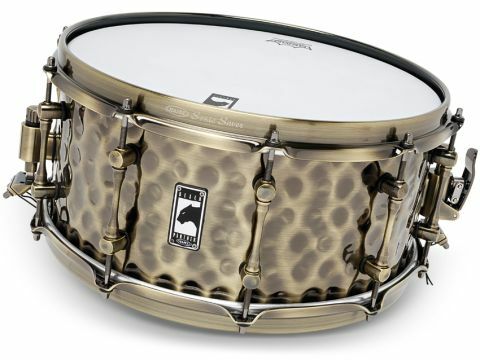 Brass is seen as the tasteful option when it comes to metal snares. We therefore feel Sledgehammer is a rather crude title for this drum, since, while it will undoubtedly give you plenty of clout when you need it, it is also capable of sensitive playing and the tone is refined. Sure, it will power the rocking-est of situations, but the tone is dark and fat with the extra depth that you expect from a 6 1/2" shell. And rim shots have a musical, bell-like ring to them. So while all you metal hammers out there might reasonably gravitate towards this beast, it certainly won't let you down on musical tone.